It was a sad day in Nevada as the funeral service was held for Carson City (NV) Deputy Carl Howell. Due to the large expected turn-out of attendees, the service was held at the Reno Events Center in downtown Reno. 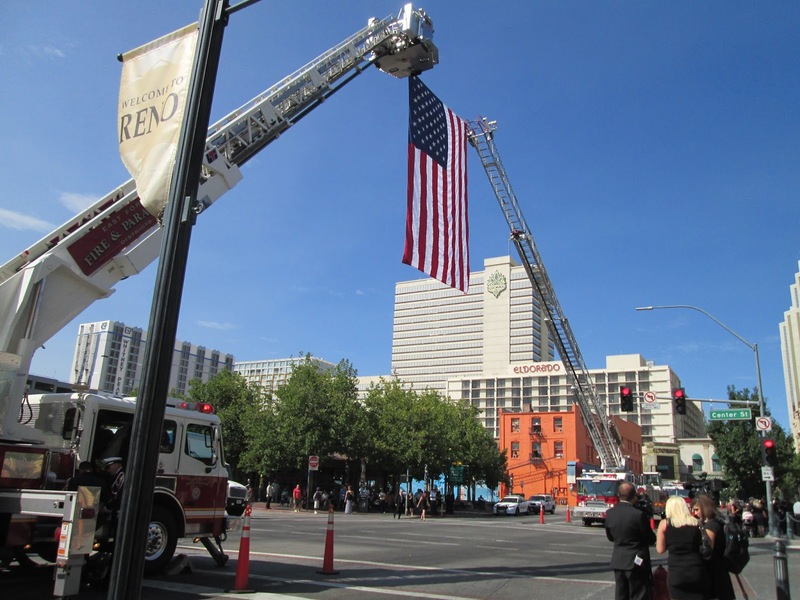 The procession of emergency vehicles, a fire engine carrying the American-flag draped casket containing the remains of the Deputy, family members in limos, and vehicles of friends and co-workers started in Carson City and went on for miles. They left Carson at 0900 hours and passed streets and highways lined with people wanting to pay their final respects to a man who gave his life during a domestic violence incident on Saturday, August 15th, 2015. The suspect in the incident shot Deputy Howell, who returned fire. The suspect died at the scene. Waiting in Reno was a nice sized crowd. Two fire department ladder trucks stretched out the ladders with a extra-large size American flag hanging between them. 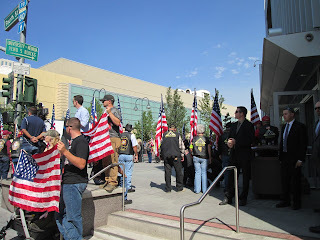 The Honor Flag, which has been displayed at funerals for line-of-duty deaths across the country was at the Events Center. Uniformed Public Safety personnel from across the country were in attendance, as were members of the armed Services and Veterans groups. It was said Governor Brian Sandoval was here but I didn't see him in the mass of people. I was standing at the corner where Nevada Senator Harry Reid exited his car - looking rather frail, if I say so. 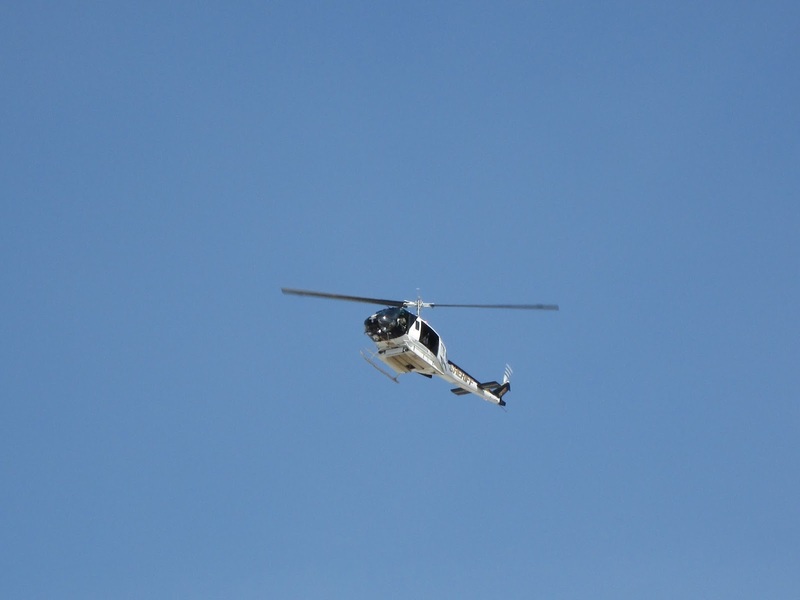 I was there with some of the Nevada Department of Wildlife Game Wardens. We rode in together. I did okay until the dispatch broadcast of the last call. Then I teared up a bit....and stayed a bit misty-eyed through the taps and bagpipes. Every time I get a 'no contact' on a status check, my mind plays out this scenario. No dispatcher ever wants to go through this. My prayers are witht he family and co-workers of Deputy Howell. 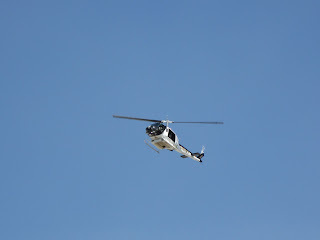 We knew the procession was just about there when two Sheriff helicopters did a fly-by. A group of patrol motorcycles escorted the fire truck and then Carson City personnel to the Center. The Honor Guard took the casket from the engine to the Center to the sound of bagpipes and a drummer. After the family and co-workers were seated, everyone else was let in. The program included speeches by the mayor, Command staff, co-workers, family, a video about the deceased officer, dispatch giving the 'last call', a singer (beautiful voice acapella), a 21 gun salute, and a benediction. I pray I never attend another department funeral but I know better. A sad day for our community. A very poignant post.